It is now possible to access the world temperature data records of over 150 years at one place. This has been made possible by climate researchers at the University of East Anglia (UEA) in the United Kingdom; they have used Google Earth as a platform to make local temperature trends and variations-aided graphs available to everyone free of cost. The Climatic Research Unit Temperature Version 4 (CRUTEM4) database, which carries information from 6,000 weather stations, allows users to scroll the world on their screens and view data on the map. Users can access monthly, seasonal and annual temperature data and see almost 20,000 graphs. The temperature records are available for many decades, dating back to 1850 in many cases. The arrangement looks like a red and green coloured checkerboard which covers almost the entire earth. To present the data, the earth has been split into boxes. Each box covers an area of 5 degrees latitude by 5 degrees longitude and is about 550km wide along the Equator, narrowing towards the North and South poles. Temperature details like an area’s annual temperature and graphs showing temperature trends appear on clicking any box. 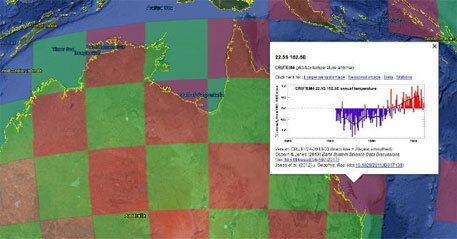 The box also gives links to more detailed downloadable station data. The checkerboard also indicates areas of land where station data is available. The colour of the boxes has nothing to do with the temperature and Google map features like zoom-in and zoom-out can be used. The new initiative has been described in a new research paper, published on February 4, in the journal Earth System Science Data. “The data itself comes from the latest CRUTEM4 figures which have been freely available on our website and via the Met Office. But we wanted to make this key temperature dataset as interactive and user-friendly as possible,” said Tim Osborn of UEA’s Climatic Research Unit. The land-surface and air temperature dataset we have showcased is one of the most widely-used records of the climate system. The move is being seen as a part of an ongoing effort to make data about past climate and climate change as accessible and transparent as possible. Osborn added, “Since this dataset has a lot of data, we expect to find a few errors. We very much encourage people to alert us to any records that seem unusual." He added that the grid had some gaps because of absence of weather stations in remote areas such as the Sahara Desert. "Users may also spot that the location of some weather stations is not exact. This is because the information we have about the latitude and longitude of each station is limited to 1 decimal place, so the station markers may not be at the actual location,” explained the researcher. Osborne also made it clear that the database was something which would improve over time as more detailed location information becomes available.